What is the minimum tolerance that we can machine to? What approvals does Tufcot® have? We currently have Lloyd’s Register approval for our Tufcot T100MP material. Is Tufcot® affected by use in fresh water? No – Tufcot material is not affected when immersed in fresh water. Is Tufcot® affected by use in salt water? No – Tufcot material is not affected when immersed in sea water. What adhesive is recommended to be used with Tufcot®? We would recommend, Loctite 330 and activator Loctite 7387 or Araldite 2012. What are the minimum and maximum working recommended operating temperatures for Tufcot material? How long is delivery of Tufcot? Typically, between 1-5 weeks. Delivery times can vary depending on if you require raw material, fully machined parts and quantities. Are Tufcot members of any trade associations or business communities? Yes – We are proud members of Composites UK who is the accredited trade association for the UK composites industry. 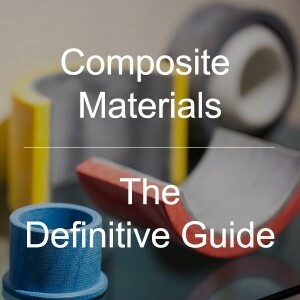 A composite is made from two or more different materials that are combined together to make a material with superior properties compared to the individual materials. When did Tufcot Engineering Ltd commence trading? The company was founded in 1981 by 3 directors who, at that time, had a combined experience of over 40 years in the plastics and composites bearing field. Tufcot is highly recommended for use where lubricants are undesirable, erratic, intermittent or none existent. Where the maintenance of lubricant films is difficult Tufcot has been found to give improved performance. Most grades of Tufcot have an extremely low rate of moisture absorption and therefore negligible dimensional change, making it suitable for use in submerged water applications. 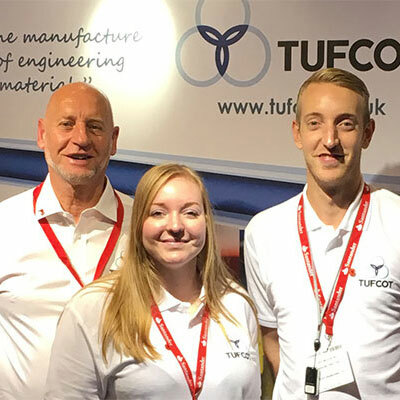 Tufcot is only 1/6 the weight of steel, is easily machined, contains no harmful or toxic materials and has exceptional dimensional stability, even in wet conditions. It offers the design engineer an attractive alternative for bushes, bearings, wear pads and many more applications. How can we link with Tufcot online? Tufcot are on several online platforms. Please see our LinkedIn profile and our Google+ profile. Does Tufcot attend any trade shows? Yes we do. Please follow our news page or Twitter @Tufcot to keep up to date with our latest trade show ventures. What is the strength/weight ratio of Tufcot®? What is Tufcots coefficient of friction? With most lubricants Tufcot has a low coefficient of friction which reduces both bearing power loss and the rate of wear. Satisfactory bearing operation with liquid lubricants depends upon the interaction between the lubricant and the bearing surface. Almost any fluid can be considered for use as a lubricant with Tufcot, although under suitable conditions water and aqueous solutions give the best results. Dynamic friction coefficients in the region of 0.003 have been recorded for Tufcot with water lubrication. How is lubricant incorporated into Tufcot®? All grades of Tufcot are available with solid lubricant incorporated. The various grades contain either Graphite, P.T.F.E. or Molybdenum Disulphide dispersed evenly throughout the material, so that the wear of a components surface continually releases further lubricant. Tufcot does not corrode and is unaffected by many solvents, inorganic solutions, fats and weak acids. No – Tufcot contains no harmful or toxic materials. Are there any safety data sheets for the different grades of Tufcot®? What are the minimum/maximum sizes of product Tufcot can manufacture? Our manufacturing capability includes a wide range of shapes and sizes. We work to customer requirement but also offer an in house design service. What machining capabilities does Tufcot® have? We have a large range of machining services available, CNC Milling, Turning, Boring, Drilling and Finishing. This ensures that many sizes and shapes of components including spherical bearings, can be designed and manufactured to in house designs or to client’s requirements. Tufcot is a Composite Engineering material manufactured from synthetic fibres and thermosetting resins. Are there any Lubricants that should not be used with Tufcot®? Where possible, unless being used as lubricants, contaminating or corroding liquids should be excluded from the bearing interface, as should abrasive particles. How much does Tufcot® material weigh and how does this compare to steel? Typical density is 1.35 gms/cc. Tufcot is only 1/6 the weight of steel. What is the best grade for fire retardancy? T400G; Fire retardant, self-lubricating grade. Essential for underground mining applications. Is Tufcot® a good insulating material? All grades of Tufcot are excellent insulating materials and may be used in many electrical applications or as insulators to separate dissimilar metals in marine applications. Can we request a certain colour of Tufcot® for our order? All grades can have a different coloured dye/pigment added if a certain colour product is required. What is the best grade for marine use? Marine Grades T100M, T100MP, T200M, T200MP. The chemical resistance of Tufcot allows many process liquors, solvents and sludge’s to be used as lubricants, in addition light or heavy mineral oils, vegetable oils, soluble oils and greases are satisfactory. T600PA and T600G have superior chemical resistance. Tufcot Grade T100 shows excellent resistance to the effects of radiation. Tufcot is non-magnetic and does not build-up static charges. These properties may often be exploited to an advantage where interference with magnetic or electrical fields, or where accumulation of static electricity must be avoided.